You are here: Home / DOT Medical Requirements / DOT Physical And Sleep Apnea Testing: Are Medical Examiners Caught Between A Rock And A Hard Place? Part 2 [You Are HERE] – DOT Physical And Sleep Apnea Testing: Are Medical Examiners Caught Between A Rock And A Hard Place? More and more drivers are being held-up (not able to renew), or held on a very short leash (30-60 day medical card) by the sleep apnea testing issue. Some DOT Certified Doctors, aka Certified Medical Examiners, are stating so-called FMCSA sleep apnea guidance or rules that the driver “has to have a sleep study test done” before getting a new medical card. Drivers who have never been diagnosed with any type of pulmonary or sleep related conditions are being targeted because their BMI or their neck size is “too big”. There are NO FMCSA guidelines or rules on sleep apnea. Previous FMCSA Proposed Recommendations on Obstructive Sleep Apnea were withdrawn by FMCSA in April 2012, and on October 15, 2013 the “sleep apnea bill” was signed into law by the President. The law forbids the FMCSA from using guidance alone to address sleep apnea screening for drivers. It requires that if the agency take action regarding sleep apnea screening, that it do so via the formal rule-making process, and not guidance. The sponsors of the sleep apnea bill inferred that guidance alone would make the transportation industry extremely vulnerable to litigation. There is no FMCSA sleep apnea guidance or rule. So let’s explore the doctor’s perspective. The Medical Examiner is held responsible for ensuring that a driver is medically fit to drive a commercial motor vehicle. The primary responsibility of the Medical Examiner is to determine the driver’s medical fitness for duty to safely operate a commercial motor vehicle. FMCSA Regulations: The examiner must comply withFMCSA regulations. FMCSA Guidance: FMCSA provides medical guidance or advisory criteria to assist in the evaluation of medical fitness to operate a commercial motor vehicle. These guidelines are based on expert review and considered best practice. The examiner may or may not choose to use these recommended guidelines. When the certification decision does not conform to the recommendations, the reason(s) for not following the medical guidelines should be included in the documentation / long form. Refer for further Testing / Evaluation: The examiner does not have the job of diagnosing or treating any condition that a driver may present with. The examiner is responsible to refer the driver for further testing / evaluation if the examiner suspects an undiagnosed or worsening medical problem. This puts the Medical Examiner between a rock and a hard place and there is lots of room for interpretation here. And where there’s interpretation, there’s opportunity for litigation. The last thing a doctor needs is litigation – for the price of a DOT physical exam! Commercial drivers are at the bottom of the hill! What can commercial drivers do to avert this situation? Be aware of the difference circumstances and perspectives around the sleep apnea issue that could affect both your livelihood and your life. Since there is no FMCSA regulation regarding sleep apnea evaluation and the basic parameters are subject to interpretation, then be aware of the Medical Examiner’s position. The medical examiner’s job is not to diagnose. It is to assess the driver’s medical fitness to determine if any safety risk issues exist. If there is a reasonable chance of risk then the examiner will request that a specialist in that field provide a proper diagnosis and treatment if necessary. If you’ve been diagnosed with sleep apnea, then another set of regulations apply. By being proactive, you get to manage this before it becomes an issue. 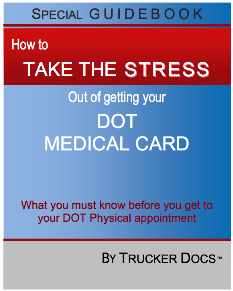 Thanks to Trucker Docs expert panel doctor, Dr. Kenn Seals, for contributing to this article. You can find Dr. Seals at Chiro Stop in Salt Lake City, UT. Just make sure you have a recent reading off your old machine and you’ll be fine. The FMCSA guidelines are spot-on at times and vague at others. There were no new rulings regarding neck size and BMI as a proper diagnosis of sleep apnea. There are facilities that take advantage of the vagueness. Get a second opinion, because in most cases, just like your, the facility may have taking advantage of the guidelines. Find a driver friendly CME that actually understands your type of work. MY NAME IS TERRANCE D K (edited by admin for privacy)! I WAS DIAGNOSED WITH SLEEP APNEA IN FEB. 2018! I TRIED TO DO THE TREATMENT! BUT I COULD NOT GET ANY REST WITH THE MACHINE! THEN ALL KINDS OF THINGS STARTED HAPPENING, TICKETS, BAD DECISION MAKING, EVEN HAD TO STOP ON OCCASION JUST TO TAKE A NAP! SO I COULD FINISH DELIVERING MY LOAD! I DROVE OTR FOR THE LAST 3 YEARS AND I HAVEN’T HAD TICKETS OR MINOR OR MAJOR ACCIDENTS ON MY PART UNTIL I STARTED USING THE CPAP MACHINE! I COMPLAINED AND HAD NO LUCK, SO I LEFT THE JOB BECAUSE I WAS TEARING UP MY DRIVING RECORD, THAT I TRIED VERY HARD TO KEEP UP! I AM TRYING TO FIND WORK ELSEWHERE, BUT THERE IS NOTHING I CAN DO BUT GO BACK TO TRUCK DRIVING! AND I DON’T HAVE THE MACHINE ANYMORE AND THEY HAVE DROPPED MY CLASS A CDL W/TANKER TO A CLASS C! AND I CAN’T FIND A JOB ANYWHERE! I AM HOMELESS AND I AM ABLE TO WORK IF NOT FOR THE SLEEP APNEA STUDY AND CPAP MACHINE I PROBABLY WOULD HAVE HAD NO PROBLEMS BESIDES MAKING SURE I GET THE MILES I NEED TO MAKE A DECENT LIVING! IT SEEMS LIKE THIS SLEEP APNEA STUDY AND CPAP ARE TARGETING THE MEN IN THE TRUCK DRIVING INDUSTRY AND IS VERY UNFAIR, ESPECIALLY IF I PAY $1000.00 BACK CHILD SUPPORT A MONTH! I AM GLAD I AM NOT MARRIED BECAUSE MY WIFE WOULD HAVE LEFT ME ON THE ACCOUNT OF THIS! STILL! MY DRIVING CAREER IS ENDED! AND NO OTHER JOB I CAN GET WILL COME CLOSE TO THE PAY I WOULD HAVE MADE AS A TRUCK DRIVER! I AM THINKING OF FILING A LAWSUIT! BECUASE THIS MAKES NO SENSE! I NEED HELP!? The FMCSA, once upon a time, issued guidelines for neck and BMI for drivers. Those guidelines were up on the FMCSA website for a very short time frame, like two days. If those guidelines were to be followed it would have taken 60+% of the drivers off the road. So at this time there are no neck and BMI regulations. But some opportunist have used the initial FMCSA information to grease their pockets. If you have a true OSA situation then the cpap would have been a life saver, but there are many other test and questions to be answered before requesting a sleep study. But if the test is being requested based on neck size and BMI, we would recommend seeking a second opinion elsewhere. Can you go to another medical examiner to get your dot card? Don’t they call that shopping? If you disagree with a medical examiner’s opinion, you have the right to seek a second opinion. Hey there, I just had a DOT physical today and the doc told me I had to get a sleep study done on account of my weight and neck being over the limit. They gave me a three month med card. My question is, if I lose weight, to be back under the threshold will that allow me to get my card renewed? Or do I have to get the sleep test no matter what? If you qualify without the sleep study, which was based on weight and neck size (which is not a true measure for determining whether you need a sleep test done). Then lose the weight and get a second opinion somewhere else. My husband did exactly that and they said he still had to do the test due to his original measurement. He had only lost like 5 pounds and his neck went from 19 to 16 something. I don’t think the measurements were right in the first place. Now he has a diagnosis and the machine does the opposite of what it’s supposed to do because he can’t sleep with it on. My husband is a school bus driver. He was diagnosed with sleep apnea 6+ years ago but had never uses his cpap. He got his CDL 4 years ago and has renewed his med card several times and has never been asked about SA until now, they have now told him he is denied renewal needs to supply a 30 day read out before they will approve him. He has an outdated machine and no chip. What should he do? He went to another dr for a second opinion and was passed but his work told him they only use this one place and that what he did was illegal and they told him he could not drive til he got this straightened out. I’m lost, couldn’t they have given him a 30 or 60 day card to try to get a new machine and read out? Please help. Sounds like a company policy over-riding a CME. You could go ask the original examiner for a short card by explaining your situation and the need for a new machine that can provide a readout. Hector – Sorry to hear that someone stole your CPAP machine. If it was stolen from your truck or home hopefully you filed a police report and if you have insurance it may be covered for replacement. Or you may have to purchase a new machine. In either case you should contact you physician and have them order a new machine for you. Now if you have had your machine for some time 5+ years then you might be in need of a new sleep evaluation and if that’s case your medical insurance will cover some of the cost for the test and new CPAP equipment. Hope this helps. Probably not until you can provide a 30 day readout. Will you still be able to get a 3 month, 6 month DOT card in 2018? I’m a diabetic and on one of the new drugs that dumps sugar into your urine. Even though the finger stick shows a very good reading (98) and my A1C is below disqualifying I still have to have my doctor fill out paperwork saying I’m not on insulin and it’s controlled with the meds. I got all the info within 3 days, returned it and for the 1st time ever got issued a 3 month card. I keep telling the Dr. you have to educate yourself on these new drugs and how they work. It seems like where I go for the physical no one there is comfortable qualifying me. Next time I’m bringing everything from my regular Dr. with me. You always want to take you latest A1C and the name of the medication so the CME understands why there is a sugar spillover in your urine. And you may be cleared for one year. That’s my plan moving forward. However, we were told that in 2018 you would not be issued a 3, 6 month card. I don’t believe that part of the law has changed. I fully understand the new 45 days rule. So, my question is will or could you still be issued a 3 or 6 month card if the Doctor wants to closely watch your medical issue. Of course. The medical examiner may issue a short card any time a medical condition needs to be monitored closely. My situation has been a complete nightmare. So much that I stopped driving because of it. I went 8 months without pay while they preformed their witch hunt. But I have a great opportunity now and would like to start driving again. The dot doctor, seen in the system, that a neurologist ordered a sleep study because I was having headaches. The first one showed no sleep apnea so they scheduled a 2nd one. The second gave them just enough to claim I have sleep apnea. Now, I don’t have trouble sleeping nor am I tired during the day. They gave me a cpap machine but I was fired before I could complete the first 30 days of using it. And to be honest, i feel absolutely horrible when I use it. I’ve since then…lost about 30lbs. Can I just go to another dot doctor and get a physical and med card. The only reason this came up to begin with was the dot doctor was at the same hospital as my doctor and the neurologist. If not, can I get a “second opinion” sleep study done? It’s been 8 months since I had the last one. What’s even worse was at the time I had this done, I still had a valid med for that was good for a year and half. Please help. Thank you. Go to a different certified medical examiner for your DOT medical and get a second opinion. Is it legal for me to do so after the 2nd sleep study showed mild sleep apnea? I know if I just go to a different dot doctor I’ll pass with flying colors. Yes, you are entitled to go and get a second opinion. Does this apply in every state? I’m in Texas and this sounds like my husband’s story minus the headaches. He d.c. doesn’t get sleepy during the day and sleeps all night besides the occasional wake interruption from our toddlers. The regulations that were implemented only benefited the sleep apenea Doctors and the CPAP machine! My horror story: I am a day driver, class B with air brakes, M-F 7am to 3:30. I have to have a DOT medical card. One day a few years back, it was time for the physical. At the clinic, a girl comes in, puts a tape measure around my neck, on the outside of my shirt collar. I had no idea what this new thing is for, obviously she didn’t know how to measure inside a shirt. The Dr comes in, says won’t give me a med card until I go get tested for sleep apnea, shock to me, I have always slept great, never nap during the day. But ok, a test will show I don’t have sleep apnea. But NO, apparently many “Sleep Doctors” are aware of the new regulations! Guess what, not covered by insurance, because my personal Dr did not request it, a person at a walk in clinic did. So I have to pay $1500 to get the test, The sleep Dr says I do have it! I could not believe it. So more money for the machine. I have not had a good nights sleep since. I was in the SYSTEM. I still did not think I had a sleeping problem, so I paid for a second test, different Dr, guess what, he says I do not have sleep apnea, I go to the DOT clinic with my new test results, sorry mam, once your in the system, we can’t take you out of it. I go back to the first sleep Dr, of course angry, his exact reply to me, “SLEEP APNEA HAS BECOME A VERY LUCRATIVE BUSSINESS SINCE THE NEW REGULATIONS, MANY OF MY FRIENDS HAVE CHANGED TO SLEEP STUDY MEDICINE, I HAVE NOT HAD ONE SINGLE PATIENT WHO HAS NOT HAD SLEEP APNEA.! No matter what I have tried or done, I can not get out of THE SYSTEM! It was always about money, I pray my company will drop this stupidity! I want to sleep at night again! this. How do I counter this if necessary. No, the CME cannot write a report that will finish you as a driver. Secondly, wearing your hearing aids, go and get a second opinion somewhere else. I do not have a CDL.I drive a 26ft straight truck that is under the weight. I took a DOT Physical last month and everything went well until they did the neck measuring. The Doctors says I need a sleep apnea test. I have no Medical because I just started this job. (1) Does anyone know how much a sleep apnea test cost? (2) I DO NOT have a CDL, just the basic class C, Am I still under these same guidelines? You fall under state variances, not FMCSA. Go for a second opinion and explain that you’re a class C driver, not a class A driver. Thanks for replying back, I will do that! You can go to the hospital they do sleep tests and ask to do this test at home. At the hospital it cost 1,500 if you do it at home it’s 500. And then you can make payments that way. Abmi 40 and great should be tested gor sleep disturbances or a i 33-39 and the driver has 3- or more other risk factors/ symptons should be tested . Or a home sleep test (if a board certified clinician in sleep medicine approves) .the home sleep test should be for at least two nights and accompanied by a chain of custody ( so tge driver may demonstrate to the CME he/sge is the one testing at home. If no chain of custody and the driver shows a Normal result the CME may not except the result. Hello, Im a Class B CDL holder in Indiana. I am a supply manager for the local power company and am required to hold a CDL if the need to drive a truck arises. I went to a doc in a box to get my re cert. She hit me with a 90 day cert for a blood pressure of 144/92 from what your site says that should be Stage 1 and should be a 1 year cert. On top of that recommends a sleep study solely on BMI per the notes. I have never had any issues before getting a two year cert before. I feel she did not understand what the guide lines are for a DOT physical. Now my job is a jeopardy if I don’t comply with her findings. Which I believe are incorrect. I have changed my diet, I hope to have this blood pressure under control when I see my doctor to clear up this 90 day cert. Can she write up what ever she thinks and I am forced to comply even if it’s against guidelines? You can always go somewhere else for a second opinion. The CME is always looking for possible risk factors, but you hold a class b cdl and should fall under the states variances. As far as the blood pressure, if you do not take blood pressure medication and this is the first time with stage one hypertension, then the CME has the privilege of limiting the length of the certificate to a shorter time frame, so that you will get your blood pressure under control, one way or another. You do not need a class A longhaul interstate DOT medical certificate. What you do need is a valid medical certificate to drive your box truck. You fall under the states variances. Think of it like apples and oranges. You can’t grade an apple by an oranges standards and vice versa. So explain to the medical examiner what your job entails and make sure he/she is going by the state’s standards. That should get you a valid medical certificate, no need for the sleep study unless there are other signs or symptoms, and allows you to drive interstate if needed. Thus satisfying the company’s request. I have over a year left on my Med Card yet a prospecie employer is requiring a “physical test” by a third party DR. Insight at orientation at which time a new DOT medical exam card “may” be issued. This third party pushes cpap machines and so if they give a 90 day card to do apnea testing can I just go get my doctor to do a new exam immediately? Or do I have to wait for the 90 days to run out? I’m thinking of just not going risking it and just finding a different job. If you go for the job, then you would want wait for a reasonable amount of time, before requesting a second opinion. FMCSA would see it as doctor shopping, if done one right on top of the other. If you know that you do not have OSA, then you could get your doctor to write a note stating so. I have found if you work for a small trucking company they don’t care where you get your medical card as long as it’s valid. You may not make as much money working for a small company but there is less bs. I’m a Teamster CDL B driver. My Medical Card expired This month was told to get a new one before April 24 here in the state of Michigan or lose my CDL license . I went to Concentra Medical for my test last week I passed except my Sleep Apnea which I have been using CPAP for 16 years and never missed a night using it then I was told Doc will not issue me a Certificate from my not having a CPAP card year of use. I never needed a card for machine in my 25 years as a truck driver and always told the Dr in past about my SA I never lied. I have been offered a job this week but cant take it I have been out of work for 11/2 years. my present machine is new and I was able to get 1 week of use to Dr but he wants a full year. I never knew about this new law. HELP!!!! First you are a class B driver and someone is trying to hold you to a class A, interstate standard, wrong. Second, all you need by law would be a thirty day readout from your machine. Get a medical release form from your doctor with an explanation of your situation and then go somewhere else for a second opinion. The doc-in-a-box facilities are looking to make money, not work with the drivers. Good luck with the new job. Individuals recently diagnosed with OSA may be conditionally certified for one month during which time they will be started on CPAP therapy. At the end of this month, they can be conditionally certified for 3 months if compliance to CPAP is documented in the two previous weeks. Compliance should be reassessed at 3 months. If at the three month assessment such an individual demonstrates treatment compliance, that individual may be certified for a period of one year. The commercial driver needs to receive information that if they stop using their CPAP during this one year period, they should stop driving a commercial vehicle. They should be warned that if they stop using their CPAP and are involved in a crash, then it is likely that they will be considered liable by the legal community. At one year, future recertification should be dependent upon proof of continued compliance with treatment. At the end of one year the certifying physician should review all compliance data for that year. Second issue. Sleep apnea doesn’t only lead to sleepiness overnight, but daytime sleepiness as well. So daytime vrs night time driving isn’t a reason to change your certification standards. Either B or A certification is that the provider decide that there is not a medical reason for someone to be unfit to certify. Daytime sleepiness included. This driver has the diagnosis of OSA (not being screened, but already dx.. that is another issue entirely). If the FMCSA has come up with considerations on their expert panel to screen and help reduce the risk that some drivers present and that provider is convinced after reading the literature that that would pose a risk if untreated, then it is their responsibility to assess compliance. Correct? If the driver has gaps in coverage because of intermittent noncompliance (I can’t tell you how often I hear folks saying they only treat before an exam.. high blood pressure and osa included in that mania) and the examiner didn’t require the recommended ENTIRE year of paperwork.. then… he didn’t actually follow the recommendations. But again.. that’s for class A.
I live in PA and have a class A licence but my job only requires a class B. Can I go to another DR and get a new physical? I’m being told that with the new laws for 2017 that isn’t allowed and that my CDL will be red flagged and I will lose it. Is this true. You are welcome to go and get a second opinion with any NRCME registered doctor. Hi, My Medical card was expired for almost a year. I went to renew it, and was told I will only get a 60 day renewal and that I need a Sleep abnea test. I think this is bs, I have been driving for 20 yrs with no problems. I didn’t turn any form into the CA Dmw. My question is, can I wait for the 60 day to expire and than get another physical from a different doctor without the sleep test? I had type1 hypertension, and was told I’m obesit, I’m 6’1 and 228, lol. I exercise daily and have been eating healthy. My blood pressure is now normal. Thanks. Hello I would love to help you. The whole Sleep apnea testing will soon be mandatory.The reason this is so important is because sleep apnea is very dangerous and increases your risk 5 times higher to be involved in an accident and increases risks for heart attack and other health issues related to hypertension and obesity. I work for a home sleep testing facility that can ship a sleep testing device to you it has three attachments you sleep on it wherever you are and send it back via mail or one of our locations. A history of high blood pressure and on medications will cause a limited DOT physical to one year at the time. If you are no longer taking medications, make sure you have a note from your primary doctor indicating that you no longer need meds to maintain your BP. As far as the sleep study, you can wait out the 60 days and go somewhere else for a second opinion. Since there were no new rules regarding sleep studies, you can get a second opinion any time you like. Most professions, once they have you on something, are highly motivated to keep you on it. You are a class B driver and don’t drive OTR for extended periods of time. Not sure about your state requirements, so check with your local drivers license department and see what they have to say. We suspect that you will not lose your CDL, but may have some serious questions when it comes to getting your medical certificate. Most of those issues should be resolved with an explanation about the changes you made and the type of driver you are. It would be great if your sleep doctor would write a release note indicating that he agrees that you do not need the CPAP. I don’t think the FMCSA provider actually personally cares if you have apea or not. They normally just want to fill out their paperwork and be done. They aren’t the docs who are to make any diagnosis (they have to ask other docs to do that). The FMCSA doc who does your exam doesn’t have any stake in you doing your CPAP. So would be super happy that you’re happy, but would require a release note from a treating Sleep doctor that states you don’t have expressed medical condition so they don’t have to go by those standards with you anymore. That being said, there are only a few methods listed to actually accomplish this that are considered acceptable. This is do to measuring the compliance of therapy. While there were no specific recommendations on pillows one can extrapolate how they would handle this as is similar to dental appliances given the recommendations are based on if t’s permanent and can be proven. However, again, no specific statement. As with many medical conditions folks are always coming out with different ways to treat them, which may be fantastic, however it often takes data to prove to folks that they are indeed, wonderful. The (semi)permanent fixes for apnea (weight loss surgery) do have guidelines for docs on how to prove that the drivers no longer have apnea and to get those folks to remove the sleep anea treatment needs from their medical history (not that they had it before, but now include that they had it, lost it, and no longer need treatment for it). The temporary solutions (dental appliances and likely pillows) can be removed, replaced, unused etc. “Currently there is no method of measuring compliance among individuals treated with dental appliances. Consequently, use of dental appliances cannot be considered an acceptable alternative to PAP in individuals who require certification to drive a commercial motor vehicle for the purposes of interstate commerce.” I assume pillows may go the same way. Again.. new things have not been studied, always possible that it will swing in your favor. Even then, you kinda’ have to prove it’s working by using the pillow showing on a study that it did actually remove your apnea and get a sleep doctor to agree and write you a letter proving it (even weight loss surgery doesn’t always work… so they have to take a study after doing it to see if it’s actually gone). However again.. just like with dental appliances… it’s still not likely to be accepted. I am not a truck driver, but a school bus driver. We have to do the same DOT Medical tests that truckers have to do even though I am very local which I feel is wrong. Last year I went for my exam and because I was in the process of not only driving early mornings, had several sick family members at home, and was packing to move to a new home I yawned in front of the doctor (I did explain all this to her after she asked if I was tired). She immediately said I had to go get tested cause I was sleepy in the middle of the day and I was overweight (mind you I had lost 25 lbs. from the prior year). She gave me a 3 month card till I had the test and it took 2 months to get into an ENT to order the test. The test showed I have a very mild case of sleep apnea (under 5 episodes in that session). Even though I have such I mild case I am being told I have to wear a CPAP in order to be incompliance with DOT medical regulations. I have done so even though I feel it is stupid for something that a mouth guard would cure. I feel though that I get less sleep with this machine on cause if the nose thing slips I instantly wake up and readjust it which means I am losing sleep fussing with this device 2-3 times a night. Recently though I have been having problems with the device causing excess air to build up in my stomach to the point that it actually has made me sick. I stopped wearing it and have slept actually through the night for the past month (except now I have a cold). I did finally get ahold of the supervising company and my ENT doctor agreed to lower the pressure, but it wasn’t done, so I still won’t wear the CPAP until I feel like I won’t blow up like a balloon. What I want to know is there anything about mild sleep apnea having to HAVE TO wear this device? If so/not where? I want to be able to go into my ENT and the DOT doctors with informed information so that I hopefully can get off this device for good. We have no idea why a school bus driver who is not a class A over the road driver is being held to a class A standard. The CME that is doing this to you simply does not understand what they need to be evaluating. We suggest that you go get a second opinion from another examiner that understands that you are a school bus driver and see what they have to say. Since there where no new rules regarding sleep apnea, even for the class A OTR drivers, you are being taken for a ride. Time to get off this train and change examiners. OK I am a mechanic I don’t drive. Unless it’s to take a broken down bus or tractor out to a driver and I have to do the ODT physical. 17.5″ neck, bmi >35, man, >50 y.o. These are the guidelines they say require a sleep test for me. Insurance company denied 2 referrals from pc physician. DOT medical examiner would not issue card without it. I am in the Utility industry, we drive maybe 1-1 1\2 hrs in an 8 hr day. Head of safety says there is no law for this, insurance says no medical necessity, no other symptoms, had spell of being tired 12 years ago, in hospital test was negative. What do we do? It has been 45 days since my appointment, because of the back and forth with the insurance I’m now going to have to take another physical even after I finally get a sleep apnea test appointment. Why isn’t Congress going back to the FMCSA and telling them to drop their guidelines until the regulation takes effect on 6/22/2018 which allows the medical examiner to require testing under the guideline criteria? That is exactly what the law Congress past, told them to do. There are no rules or regulations in the FMCSA guidelines requiring a sleep study based ONLY on neck measurements and BMI. Go get a second opinion from someone else. Because of my neck size….yes, I have to have a sleep study. Have class A and have been driving 25 years. Tried study at home, didn’t work so well. Had study done at sleep center in VA. where I live. Very difficult to try and sleep with wires in all directions coming off of you. That being said, they determined I have “sleep apnea”. Now they want to do another test using a cpap machine. Hmmmm. Think I’ll sleep better without all the wires? I expect so! But that doesn’t seem fair! Why not test me with nothing attached to get a true reading, because I have no problem sleeping at home as it is. Seems like a scam to me. Can you help? Hey post – I learned a lot from the info ! Does anyone know where my assistant might be able to acquire a sample NJ UST-021 copy to edit ? Yes you can choose your own sleep doctor, but you want to make sure you use this 3 months to address the problem, and get in compliance with a cpap if you need one. Get a medical release from the sleep study doctor and take that to the CME for your next DOT physical exam. My husband took a physical, got a three month extension because he was sent for a sleep study. He just did the sleep study last night and it was a split night test (they put a cpap on him around 1am). He does not agree that he needed to go for the sleep study at all, can he get a second opinion 1/2 way through this process or does he need to see this all the way through? If he feels that the sleep study is uncalled for and that he and his doctor agree that he does not demonstrate symptoms of OSA, then you can go somewhere else for a second opinion. Go get a second opinion and explain to the examiner that you drive a school bus and are not trying for an interstate certificate. With that information the CME can make a more informed decision. If you never drive out of the home state with the school bus, then talk to them about intra-state only. There are different regulations regarding interstate and intra-state drivers. Not without a note from the sleep doctor. You are showing good compliance, but you are still using the CPAP. Hello, what are other indicators that Dr, PA or NP use to determine you may need to have a sleep study? If neck size and BMI are not to be used? If your blood pressure, heart rate and hypertension are all well and gd what else is there? There are many indicators that should be looked at. Neck size and BMI are the two laziest ways to make that evaluation. You could start with things like excessive daytime sleepiness, restless leg syndrome, hypertension, etc. There are tests that can be found on the internet that will answer this question in more detail. I just had my exam done at concentra and they gave me a 90 day card and said I had to have a sleep study done. First I looked at last years results and my BP weight and neck size was exactly the same BP was a little lower, even my pulse rate was exactly the same but no sleep study. I sleep on my stomach and I want to know how am am going to do the sleep study and wear the cpap. I will not change the way I sleep for a machine because then I will not get any sleep. I told the examiner this and I don’t even considered this. But what I really want to know is same results last year as this year and I go from normal to abnormal. What kind of guidelines are they using dart or what? They are using the new guidelines that are made to make them more money by taking advantage of the drivers not knowing the rules or guidelines. Try getting a second opinion somewhere else. I am a self-pay for my cdl recert. medical card. I had it done on April 13th and doctor said that I needed clearance from a sleep medicine specialist to get my year card. I do have a high BMI and neck size was around 16 (I am female). I only work 20-25hrs a week and I am never EVER sleepy. He gave me a 90 days card (7/13/16) and gave me a form to give to the specialist to fill out. I went to sleep doc, had home study done and it was inconclusive because I move around a lot at night and the specialist still told me that I MIGHT, I repeat MIGHT have very VERY mild sleep apnea. At this point, I am thinking of going to another CME to get my medical card. I temporarily made an appointment for May 12th. What do you think? who pays for the hospital sleep apnea study the employer or me? There is no regulation on this, so the only person who can answer this question for you is your employer. Concentre is running a racket.to make more money. you have to go do a sleep study then come back in 90 days and they make more money everything you come back. someone needs to get a lawyer in on this! They just told me I had to have one on a resurt and my last physical was 3 months ago at the same place only difference is I’ve lost weight. Get a second opinion from your pulmonary specialist. That should be sufficient. If Concentra questions it, then by law you have the right to request a second opinion from the examiner of your choice. Can’t give much help on company policy. I went to a DOT Doctor yesterday and when they measured my neck she did not go directly around my neck she let it hang down to around my collar bone area. Is this normal? Is there a way to argue this because now I have to a sleep test. Yes, go get a second opinion elsewhere. Hefty is not a disqualifier from the FMCSA. Go for a second opinion from a doctor that works with drivers all the time. They have a better feel for the rules and regulations then the doc-in-a-box places. The at home test are simply not as reliable as the lab studies. First you want to know if you really have such a condition. Any one who actually has sleep apnea will not leave home without a unit. But there are some clinics that say it is the law-and that is a lie. There were no new rulings regarding the condition and if you do not have a number of the issues that would necessitate the study, then someone may be trying to take advantage of your not knowing. So get a second opinion. my cpap machine is outdated and has no chip in it. And my dot card expires in two weeks , my company wants it done asap, what do i do ? What are the possibilities of upgrading your machine? More than likely you will be needing a newer machine to provide the needed information for the DOT examiner anyway. 90 days @ 70% & 4 hours a night, should be more than adequate for the examiner. Who diagnosed you with sleep apnea? Since there were no new rules regarding sleep apnea and no neck measurements or BMI charts, who made this diagnosis and how. Try going to the original doctor from your past and have him give you a medical release form stating what his findings were. That should help the most. The CME will want to see a 70% compliance record for at least thirty (30) day before issuing a new medical card. Only if it is a company policy. The neck size is way under the mark, so I don’t understand why you would have been told such a thing. Why not go get another physical somewhere else and have it supersede the last one. You should still be working with your doctor regarding your machine and its settings. Explain to him your situation. It may be as simple as getting a low profile mask and changing the setting on the unit. You should be breathing easier, not harder. You are going to have to demonstrate proper usage and compliance with your CPAP before you will clear with the DOT examiner. So talk with your doctor beforehand and get things under control. Ok, it took me about 3 months to totally get used to my machine. Its the best thing I`ve ever done in my life. I feel better and I don’t fall asleep during the day. Went for my DOT. I am 6’5” and around #340. Moderate hypertension under control with med for years. They gave me 30 days and said report to pulmonary Dr. for sleep apnea evaluation. BMI over DOT limit, and neck size 19″. The last time my neck was less than 17″ was in the 10th grade. I do not have any symptoms of sleep apnea. Do I have to have a sleep study to get DOT cleared, or just self certify and ignore the visit to the sleep Dr.
Can’t lose my CDL, but the 30 day extension does not give me much time. What is the best direction to take? BTW, it was a PA and they used three different machines for my blood pressure and got three different readings in less than 15 minutes. Went to my regular physician last month and he said my BP was good/normal. You need to have a valid medical card before you will be able to maintain your drivers license. Your best best is to go somewhere else to get your DOT medical certificate. There were no new rules and there is no such thing as a BMI limit for the FMCSA. So someone is over-reading their study materials and trying to take advantage of a situation. Now if you do experience excessive daytime sleepiness then you do want to take the sleep test, but if you function fine all day long, then you probably don’t need to take an expensive test. You’ll need a medical release form from your sleep doctor and a printed copy of your last report from your unit before a CME is going to do an examination. Based on all of his findings will determine whether you’ll pass or not. It’s never just one thing, but a picture of the whole person that the CME must address. I am trying to figure out if a trucking company can force you to use a company 850 miles away instead of your PCP. because of that I couldn’t get a mask that fit properly and lost my job. I know of several drivers who have been suspended for mask not fitting properly. One driver had been tested 4 years ago and was under care of his PCP and was told he couldn’t do that anymore and had to use this other company. Can a company force you to do that? Not sure if any company has a policy that would force you to do such a thing. And if the policy of the company is such, do you really want to work for them? You could ask for a copy of the policy from the HR department so that you could see it writing, and then make your final decision. Question: I was required to do a sleep study. Among the paperwork they require you to sign before they even talk to you states ” I agree that I have been tested for and have been found to have OSA obstructive sleep apnea.” Of course I refused to sign it and they told me they are not supposed to give me the test if don’t sign it. Is that even legal? In short they gave me the test, I wore it for 6hr 4min, it evaluated from 1:45am to 5:12am. They are trying to get me to take an in-house test stating that the flow evaluation on registered 29 minutes and they need 2 hrs. I have the papers, can my employer make me take another one because they request it? Question #1: It may be their policy and you were right to refuse. No law has ever stated this as mandatory. Question #2: I guess if the employer is going to pay for it, they could ask you to take the test, but otherwise I don’t think so, unless the company has some policy that is already in place. Hello,I recently went for my DOT physical and everything was fine however the Examiner said that because of my BMI and neck size, that I would have to go for a sleep study. CRAZY!!!! Because I’ve never been diagnosed with any type of sleep disorders so with that being said what can I do? No new rules or regulations regarding sleep apnea. Take your business elsewhere. If they based their entire decision on bmi and neck measurements, then they don’t understand the FMCSA guidelines very well, so go elsewhere for a DOT physical. Hello, My husband has a CDL and went to Concentra for a DOT phyical had see heart Dr before going to Concentra. Heart DR did the EKG and blood work all was good. Now Concentra states that he will need to have a sleep study be cause of High BMI Neck Size and BP. Is this Something that HE has to have for the CDL? We do have an appointment with our PCP however with appointment after appointment it could be 6 months until all are done. There were no new rulings on sleep apnea and bmi or neck measurements, (according to FMCSA), so unless there is excessive daytime sleepiness signs and symptoms I would get a note from your primary doctor stating that your hubby does not have sleep apnea. Then I would take my business elsewhere. Certain heart conditions require a stress test every two years. So, not knowing what your specific conditions is, I will assume that one stress test every two years and a medical release form completed by your cardiologist each year should do for you. File a complaint with the FMCSA and talk with a good attorney. I’m having this same issue. I went and had my DOT physical done June 26. The nurse practitioner walked in the room and without saying anything else looked me straight in the face and said “You’re not going to like what I have to say. You’re fat and you need a sleep apnea test done.” I inquired whether or not this is mandatory and she informed me that its a law. My employer does not mandate it, I have found no information regarding any laws in Indiana with the DOT or FMCSA. I contacted a lawyer and they said there was nothing they could do since it is an adopted guideline, its not considered malpractice. I can’t afford to pay out of pocket for this unnecessary procedure when they’re only motivation is telling me I’m fat…therefore…..
We’ll start with the fact that the nurse practitioner is WRONG, it is not law. If your company does not have an issue with going somewhere else, then that’s what you should do. If you need, bring a medical release form from your doctor with you explaining your situation. That will answer most of the questions that a CME will have. Why not go somewhere else, get a second opinion from someone who understands the difference between a local vs an OTR driver and get a new medical card so you can get back to work. 90 days on the CPAP with a 70% compliance for an interstate OTR driver is what FMCSA wants, but that isn’t you. are thee any new guidelines or regulations regarding the print out from a CPAP? In that my question is overall, on a 90 day period it showed my usage at 70%. The >4 hour usage was at 63%. When I went into Concentra for current physical the PA who performed my physical was not going to give me a medical card. She stated that guidelines state that the >4 hours had to be at 70%. Is a PA certified to do DOT Physicals and or issue medical cards? If the PA is on the NRCME registry, then yes they can do DOT examination and can give out medical cards. The CME is correct, but could, if they choose to, give you a 90 day for you to show full compliance with your unit. Some CMEs will work with you and others won’t. It’s about safety and CYA. My husband applied for a driving position recently (In Michigan). He once had sleep apnea but that was 8 years ago (when he was a child, and overweight). Because of this he took a sleep test so he could be MDOT certified. His doctors office got the reports back from the study saying he does not have sleep apnea, but the original place he took the drug test at, concentra, is saying he did not fulfill enough hours with the sleep test on. He does not fit any of the criteria of a person at risk for sleep apnea now. His BMI is normal and so is his neck size. His doctor wants to refer him to a sleep specialist to prove he does not have it. This is going to cost a lot of money. What I’m wondering is 1, will the sleep expert doctor saying he doesn’t have it solve the problem? and 2, since he has moved on from the original position he applied to does resolving this now aid us if he will be applying to driving positions later on? Are you flagged somehow when applying to driving positions if this isn’t resolved? Or is it more of a situation where if 90 days pass you’ll have to take the sleep study thing all over again regardless of past results? You are not flagged, and yes it would be a big help for the CME to have a medical release form from the primary sleep doctor. That release can then bypass the CME who is over-reading his job description and releases him from some level of perceived risk factor. Hi doc, I know you’ve answered this question before, but if the cme tells me I need a sleep apnea screening purely and solely based on a high bmi and then writes it on a piece of paper and only gives me a 2 month card, am I required to give that information to my new doctor For my next card? Thank You..
No new rules or regulations regarding sleep apnea. So no you don’t have to give anybody anything. Just answer the questions on the intake form truthfully and you should not have any issues. I’m in a rock and a hard place… I was diagnosed with Sleep apnea back in 2013, and I missed my annual check up with my Sleep Doctor back in Nov of 2014. I no longer have any insurance due to the fact that I only work part time. I went to get my physical done which is good for 3mos because my blood pressure was high and the company paid for it. Now, I’m trying to go full time with a different beverage company that required me to get a new physical. I was able to pass my physical, but I’m have a temporary disqualification due to my sleep study paperwork is out of date. My sleep Doctor won’t see me because I have no insurance and I have not been in his office in over a year. The beverage company won’t hire me unless I can get the “a okay” from my Sleep Doctor. So, I have no insurance and I don’t have the money to get it and then, a new sleep study if needed. Not much you will able to do until you can get the sleep doctor to see you and sign off on the whole issue. The regs are pretty strict on this one. Could you borrow the money to get in and get it done? I wanted to renew my physical card but my company told me that they preferred. Me to take my d.o.t physical up there in south Dakota i was tricked in to it i had no ideal what i was in store for.my blood pressure. Was almost perfect but they wrote me fir only 3months and now im running around like a headless chicken trying my hardest to get all if this done by the dead line f ok r my medical card wich will be up on the 16th of this month.so my question is if i cant make my deadline and my license are pulled dies that mean that im done for ever or if i get the proper treatment can i get my class A and my dot medical card renewed? So what is almost perfect blood pressure? DOT requires a BP of 140 / 90 or less. No one is going to pull your driver’s license, but you will need to get your blood pressure inside a window for the examiner to extend your medical card out to a year. If you have never had an issue with your BP, then you should be able to get it into the 140/90 range and get a one year card to give you time to get it down even further. I have to get a new DOT MED CARD but the Dr I went to says I have to get a sleep study test done . Is this a new law now that I have to get this done before my MED CARD is renewed ? in California ? Read the Sleep Apnea articles listed above. It’s not a new law, it’s not a law, and nothing different in California than the Federal requirements. If your overall health condition presents a risk for OSA then the medical examiner will require you to have a sleep study test done. Same thing happened to me today, and It cost $250 to have a sleep study done, plus $50 Co pay from a dr that I have to be referred by, all because my neck measured 18″ can I go to ANOTHER DOT PHYSICAL PLACE for another review? ? If you have a difference of opinion and want a second opinion, then you can go to another CME. There were no new rules regarding sleep apnea and BMI or neck measurements, but the CME’s should be looking at 6-8 different things that may be indicators. Wait for a month before you retake the examination, otherwise FMCSA looks at this as ‘doc shopping.’ If there are other indicators point at the probability of EDS, then you may be sent for a sleep study. Went for MI DOT in Nov. 2014 was seen by a PAC, blood pressure was high, and needed evaluated and cleared by a certified sleep specialist with evaluation, recommended treatment, follow up and sleep study results, because I answered yes to snoring. Went to my regular Dr. put me on meds for blood pressure, now I went and got a at home sleep apnea test done, went for consultation with specialist who hadn’t even seen my results until sitting there with me in front of her, says I have apnea and need a sleep study. How accurate are at home test? To even base any of this on? Now I find out my Dr. is certified for DOT can I just by pass the original exam by the PAC and go to my Dr. that I know and trust and do a new physical with him without reprocussions from original exam. I am a route driver with Class D license in New Jersey. I have in the past gotten 2 year dot cards with no problems from medical examiners paid for by employers. One in April of 2012. Then another in October of 2012 is now expired. I got hired by a company to drive a 16′ box truck with dot physical agaon paid for by employer. I went on 11/28/2014 and was told by medical professionals examiner my eyesight was 20/50 and needed eye exam. I was then told with size 19″ neck height 5’8″ and 280 lbs my bmi was 46 and I need a sleep study. I sleep fine and have not been in an accident in 30 years. I found a sleep center which is jerking me around with 2nd sleep study needed now because Dr says I have sleep apnea and need cpap machine. CME will not even give me 30 day card now with eyes good now until my cpap machine shows at least one week of me using it. He originally said he would give me 30 day card with eye exam so I could start work while resolving supposed sleep disorder. This sounds to me like it is all about milking my insurance and not my well being for providing for my family. Concentra is the dot examiner. If your vision is now corrected you should be fine. There are no new rules regarding sleep apnea. Ask to see the law, they can’t show it to you. 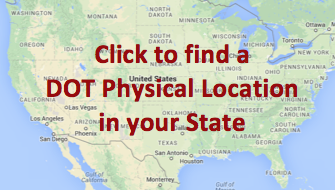 Go somewhere else for your DOT physical. Just have your sleep doctor complete your medical release form and have your compliance stats with you and you’ve just answered most of the questions that a CME will have. My current c pap machine is outdated . need one with chip to show usage. Question- Can medical examiner help me with a prescription to get my setting changed on a machine I am going to buy? my deductible is to high to buy a new one . plus my primary Dr is trying to send me through sleep study and buy a new machine. can’t afford any ideas around this? It is not the CME’s position to prescribe or diagnosis or treat any condition. Your primary already knows that you need the unit, then why would he want another sleep study? Just ask to be upgraded. so is it the law now that we have to have a sleep study for dot.or is the company pushing it. No laws. And if the company is pushing it, for some reason, then they should pay for it.